Research from the National Consortium for the Study of Terrorism and Responses to Terrorism (START) was featured in a report released today by the U.S. Senate Committee on Homeland Security and Governmental Affairs about the actions and radical network surrounding Zachary Adam Chesser. An online activist, Chesser pleaded guilty in October 2010 to attempting to provide material support to al-Shabaab -- a militant Islamist group -- among other charges. 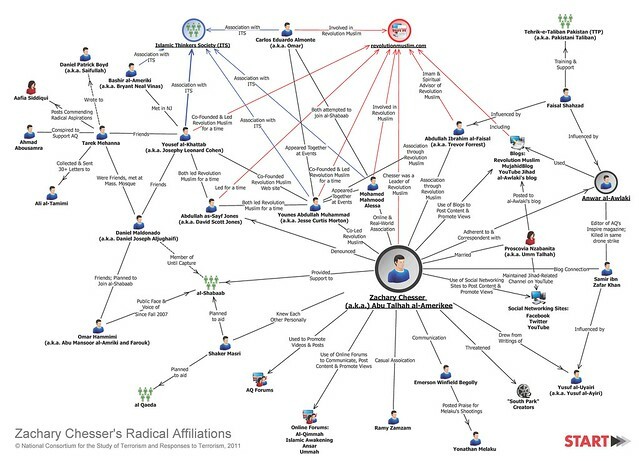 For the report, "Zachary Chesser: A Case Study in Online Radicalization," START researchers assisted Committee staff in mapping out Chesser's wider network connections. This included producing a link chart (featured on page 25 of the report) and performing an analysis of Chesser's social network. START researchers were able to rapidly generate a picture of the Chesser network by drawing on a new database that has been under development for the past year and is scheduled for public release in Spring 2012. START's Profiles of Islamic Radicalization in North America (PIRaNA) Database provides information on 211 individuals known to have radicalized in North America to the point of supporting violence from 1989 to 2011. These homegrown violent extremists started and completed a significant portion of their radicalization in North America, though not all attempted or carried out violence in North America. Each meets at least one of the following criteria: 1) indicted of violence-related crimes, 2) killed as a result of jihadist activities or 3) publicly self-identified as a member of an active jihadist organization. The vast majority of homegrown Islamic extremists (80 percent) began their radicalization after the events of 9/11 and the subsequent Global War on Terrorism. Nearly half of the identified homegrown Islamic extremists (45 percent) come from a middle class background, and the majority (59 percent) are highly rooted in their host society. Although there are considerable missing data about their conversion status, at least 24 percent of the individuals included in this study were converts to Islam. For more information on PIRaNA and related START radicalization research, contact John Sawyer at jsawyer@start.umd.edu. For more information about START or to schedule an interview with a researcher, contact Jessica Rivinius, START communications director, at 301-405-6632 or rivinius@umd.edu.